Forex Robotron | Perhaps The BEST forex robot for automated forex trading! 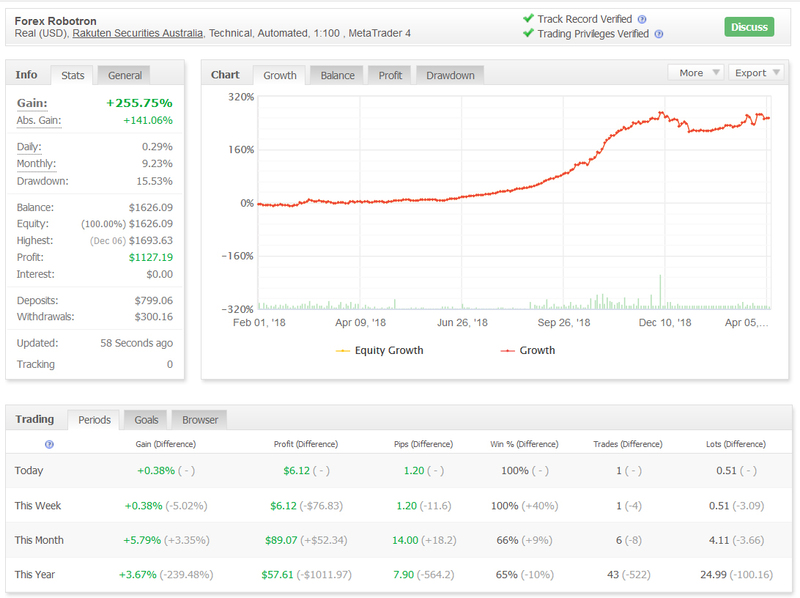 One of the only Forex Robots tested with real tick data, real variable spreads, real slippage & including trade commissions ($9 per lot, per round turn). *GBPUSD & EURGBP currency pairs temporarily removed due to uncertainty over Brexit. 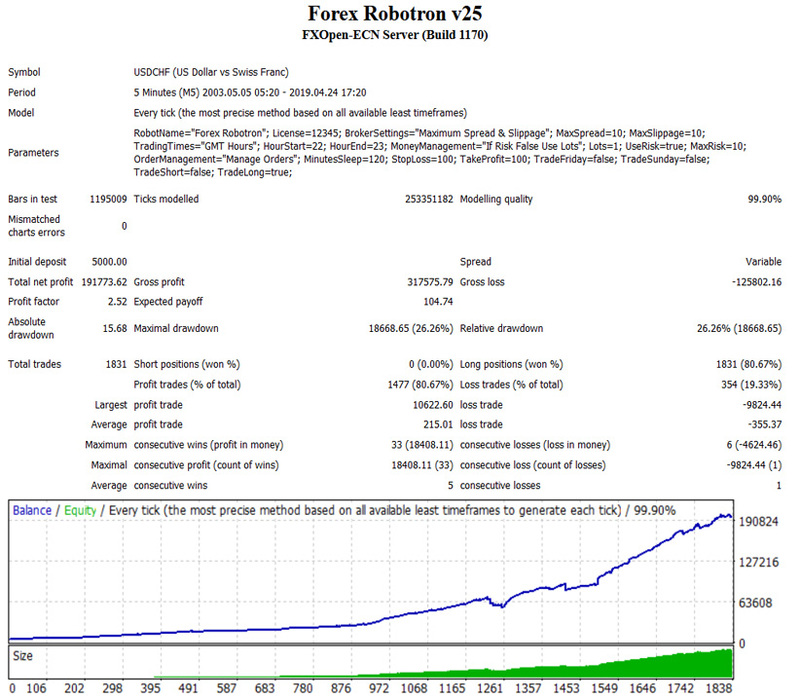 Enter deposit to see results of Forex Robotron based on historical back testing. Below are the trading results of Forex Robotron on the 5 minute time frame of the EURUSD, EURCHF, USDCHF currency pairs using the default settings over a 15 year period of back testing on historical data. 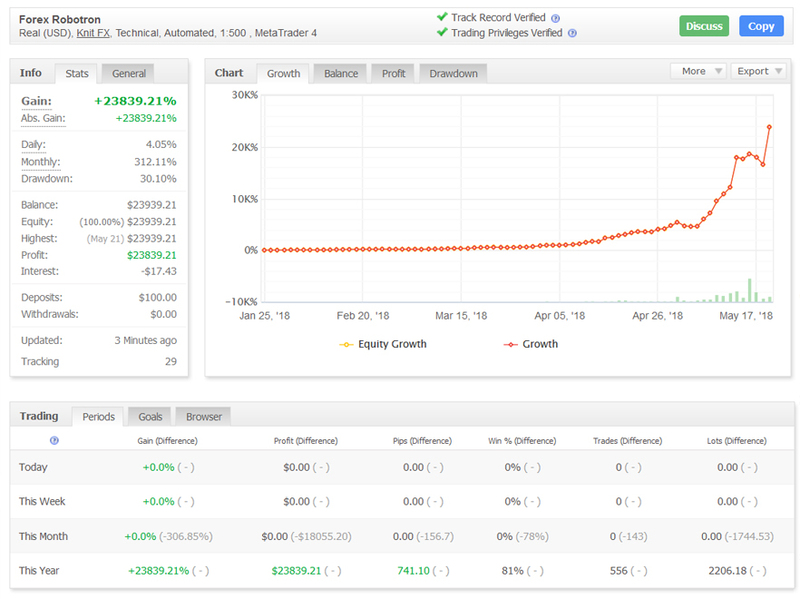 Forex Robotron back tests started with an initial deposit of $200 trading with 5% maximum risk - you can use a risk that you feel comfortable with. Forex Robotron has a built in dynamic close feature so a trade can be closed before the stop loss or take profit is reached. *USDCHF switched off during CHF peg (2012-2015). Forex Robotron is the result of years of hard work day and night, programming, testing to develop a fully automated trading solution. Thousands upon thousands of hours of programming and testing has gone into the research and development of Forex Robotron. Get INSTANT ACCESS to Forex Robotron! 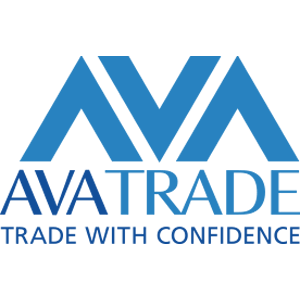 #Option 1: Sign-Up to AVA Trade broker using THIS LINK and deposit at least $250 into a verified live mt4 trading account. Contact Forex Robotron support with screenshots of your deposit and verified account to confirm and you will be sent the Premium software! Geoff, says: During all that stress what a wonderful salve your v23 bestows by simply continuing to chug along through thick & thin on my other older PC. Sincerely I can't thank you enough. Now to the good news - progress is alive, positive and rocking along at compound growth rate - wacko!! Of the 30 trading days, 23 profited, 7 didn't trade, none lost. Answer: Many thanks for the very detailed feedback. That greatly helps with my endeavours towards the next version(s) of Robotron, which I am still working day and night on would you believe! All of your points are valid and I must say that I admire your discipline and belief to succeed. Not many have the patience to become successful over the long term but pleased to hear you have had some good results as of late. More power to you my friend, wishing you all the very best as always, do let me know if you need anything my end. 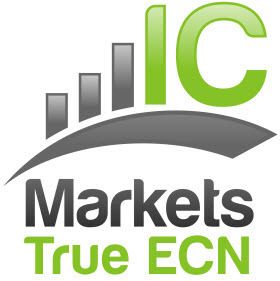 Marlon, says: It's early days yet but my IC Markets account seems to be doing well. Rod, says: You really have a FANTASTIC support!!! Your reply is like a lightning FAST! I will, thanks a lot! Answer: Thank you so much Rod for your kind words! Hendrik, says: I was a bit skeptical at first because it just sounds too good to be true. But your service and the first successes of the EA make me very happy. Thanks for the great help. I have only been trading for 4 weeks. But I knew there was a tool to automate it, even though almost everyone said there was no holy grail. Answer: Thank you for your kind words Hendrik, much appreciated. You are very welcome! 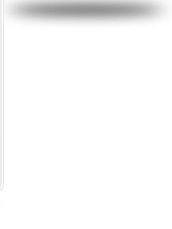 Peter, says: Please see screenshot showing successful trading activity (very nice!) for the first month or so. David, says: Thanks, Good job on the EA! Answer: You are very welcome David! Senaka, says: Thanks.Your robotron started working well.It executed two trades today profitably.I was struggling to be profitable for the past 2 years but failed.At last you helped me. Your are a great guy.Help others as well.Thank U very much again. Answer: Thank you very much Senaka! Have a great day! Sam, says: I hope you are well as we've not communicated for some time. The forex business is going well and I will always be glad that I chose Robotron as my EA in my forex business given reliability of Robotron EA, and its inbuilt safety logic I can only infer as a trader thus far and in the affirmative! Best wishes, and have a good day! Answer: Thank you very much for your kind words Sam. Glad you are happy with Robotron! Bora, says: The robot is working wonderful thank you. Answer: You are very welcome Bora, glad Robotron is working so well for you! Simon, says: I have spent Thousands of Dollars purchasing EAs that never worked. I am very happy finding Robotron. It is not just as good as its backtest, it is an EA for the future. Answer: Thank you very much Simon! Wish you all the best. Boahamed, says: Dear sir, I would like you thank you for your wounderfull EA, it's really amazing i meant I already bought it with my friend Tihomir. I feel, I am greatfull and thankfull for you both. I hope really can find another good EA in the market like your Robotron EA. I will buy it even if cost me 100k and I have no problem to share it with you for free, I need only your recommendation as per your wide experience. I hope you can suggest me some of good EAs like yours Thank you in advance, Allah save you inshaAllah Thx. Answer: Thank you very much for your kind words, I am so happy to hear how much you love Robotron! Sam, says: Thanks very much for a prompt reply. I am really liking robotron ! This is an amazing EA, consistent profits since I bought the EA, very reliable in its trade, and in equal measure - prompt excellent service from the developer! Keep up the sterling work. Answer: You are very welcome Sam! Thank you for the feedback, very happy to hear that! Ziya, says: Hi, it has been little over a month since I've started live trading with robotron, the EA is doing fine and gaining profit, it's positive and as from next week I'll be depositing more funds, Thank you. Answer: That is great news Ziya, happy to hear! Robert, says: I have been having some success with the EA, thank you. Answer: Hi Robert, Very pleased to hear you are having success with Robotron, that is great news! Sathianphan, says: How are you? Your premium software is working well right now. I'm very happy with it and also top up money under the current account. Answer: Hi Sathianphan, Very happy to hear Robotron is working great for you! Answer: Hi Kelly, Very happy to hear that you are pleased with Robotron! Juan, says: Hello! It's me again :-) So far Robotron has done a great job! I have just used it at EURUSD chart though. Answer: Happy to hear Robotron is doing great for you Juan! Paul, says: Forex Robotron has been doing very well for me for many months now, even with the ESMA leverage restricions. I could be making even more with higher leverage! Sathianphan, says: Dear Support Team, First of all, I have to thank you very much for your provided software and I'm very happy to use it. It also works well and wonderful. Software has already set and I gained the profit. In the future, I plan to buy and use another license from your Forex Robotron software. Best Regards, Sathianphan. Answer: Thank you for your kind words Sathianphan! Nice trading from Robotron yet again! Answer: So happy to hear that, thank you very much and I hope your great returns continue! You are always welcome. Lane, says: Hello, I am currently having good success with your Bot and thank you! Answer: That is great to hear Lane, glad Robotron is working well for you! Michael, says: You should know that trading so far this month Robotron has generated a return of 18.01%. BTW the 18.01% generated was after all costs (commissions, rollovers and swaps) had been deducted. It is the net, not gross return and it is very healthy. Answer: You are very welcome as always, that is a very healthy return indeed! Great trading results Michael! Answer: You are very welcome Natalia, so glad you like it! Peter, says: Thank you so much, I'm so humbled by your willingness to help and answer questions at all times. I have learnt so much through your genuine answers and support. Enjoy the rest of your weekend! Answer: You are very welcome Peter, it is an absolute pleasure to help you. Thank you, have a great Sunday! Flavio, says: I am testing Robotron demo account for the second day, I am very impressed with the results, I hope it gives the same results in real account. Congratulations! Answer: Thank you Flavio, glad you are enjoying the Robotron results! Sanchez, says: Hello, I am very happy with your ea, thank you. Answer: Very glad to hear you are happy with it. Answer: You are very welcome, so happy to help you and delighted you like it! Pete, says: You guys rock... I cannot thank you enough, if you are stuck for a testimonial or endorsements in regards to support please do not hesitate in contacting me. Answer: Thank you very much Pete! Tusher, says: OK sir...you and your EA are very good. Thank you. Have a nice day. Answer: Thank you very much Tusher! Have a nice day to! Brendan, says: Hi mate, The new touches to the way your EA operates are awesome and well engineered. Do you have any tips or recommendations yourself? Thanks, Brendan. Answer: Thank you very much for your kind words Brendan! Ziya, says: Hi, once again thank you very much and I think you should know this your support is second to none excellent job you guys are doing. Answer: Thank you very much Ziya, you are very welcome. Have a great weekend! Davide, says: Hi, congratulations for the ea is working really well. Answer: Thank you Davide, glad to hear Robotron is going very well! Zijian, says: Thank you so much. I know there are ups and downs but the amount is already a lot more than what I put in at the start. Thank you so much. Really thank you a lot. Regards, Zijian. Answer: You are more than welcome my friend, happy to hear that Robotron is doing so well for you and long may it continue. Answer: Thank you Duane, very pleased to know you are happy with support and as always if you need anything just get in touch. Have a great weekend! Martin, says: Robotron is better in behavior than many other EA's I own. Therefore and having in mind that you were very fair I would like to run Robotron in some other accounts I have. Answer: Thank you for your email and honesty - much appreciated. Answer: That is great to hear Nick! You are very welcome! Raffiek, says: Thank you, I must say the robot has been performing well thus far. I have tried many other EA's thus far and it cost me a lot of money but they are not as good as the Robotron, in fact after paying for the EA itself I also lost money on the trading itself. Well done and Thanks. Answer: Thank you so much for those very kind words, really, they mean the world to me after all of the hard work over many years put into Robotron. You are more than welcome my friend and if you need anything, you know where I am. Crispian, says: Hi, I just wanted to say that I've installed the program for almost a week now and everything has been great. Program is making me pips and your customer support has been great too. Keep up the fantastic job guys. I have one question though. How will I know when there is a update available for the program? Thank you. Answer: Hi Crispian, Thank you very much, glad to hear it is going so well! You should receive an email when there are updates. Happy pips my friend, have a great week! Franz, says: Hello my Friend! I hope you are well, V20 was performing very well this week, you are the only one on the web that I trust, because your Robot is realy working . Answer: Thank you very much for your kind words, they really mean a lot to me. Answer: Great to hear that Robotron has been performing well for you for months now. Answer: Glad to hear v21 is going well for you Mark! Answer: Excellent results yet again John! Answer: Great to hear Jacob! Answer: Great to hear your continued good results Simon! Michael, says: Hi, I am running version 15 and having a lot of success lately. I am getting excellent returns on multiple currency pairs with version 15. Answer: Nice results with Forex Robotron yet again, thank you Michael! Thomas, says: I've tested your robot and it is fabulous. Your Robotron results are phenomenal, all trades are profitable. Answer: Thank you Thomas! That is great news my friend, very happy for you! Answer: Congratulations on your good results! Have a nice day my friend. Edmond, says: Forex Robotron is still performing very well. Keep up the good work. Answer: Glad to hear it is still going well, been a while for you now! Thank you, always working on further improvements! Have a nice day my friend. Mark, says: How are you doing buddy ? I thought I would just touch base with you and say that V16 has been AMAZING !! I have 2 accounts running on FXCM that I don't think have ever had a loss !! I keep ramping up the lot size and it is just keeps giving me home runs !! I have also been running it on ICM and FXTM - both all good. Answer: That is great to hear Mark, glad it is bringing in the results! Peter, says: Thank you so much, this is really going to make a positive difference in my life and family - Enjoy your weekend too! Answer: Aw Peter, that is great to hear, you are very welcome as always, my pleasure. Thank you! Answer: Thank you so much for your very kind words Guarav, much appreciated! 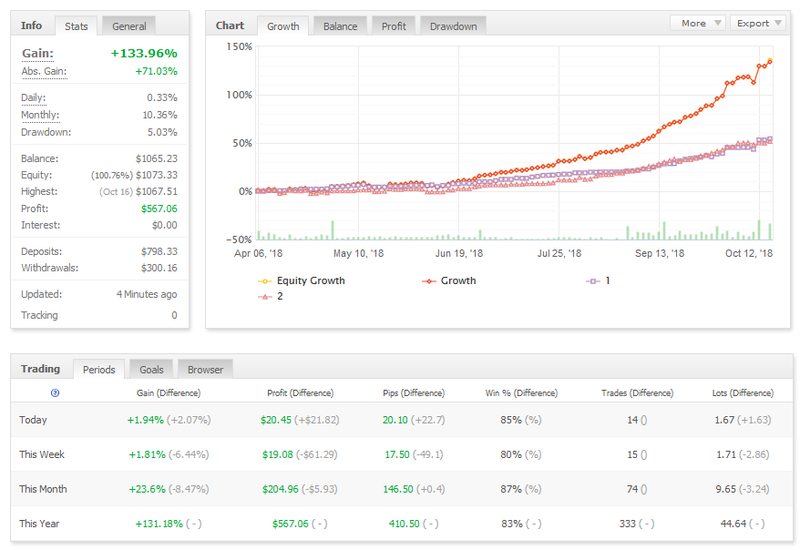 Edmond, says: Hi there, Results for version 20 are amazing, not 1 single loss for a whole week. I'll be switching this on one of my live trading accounts. Thanks & Best Regards, Edmond. Answer: That is great to hear! Answer: You are very welcome Davide, happy to hear you like how it works! Answer: Great results so far! Answer: Thank you so much for those kind words - they really mean the world to me and make all of the hard work I have spent on Robotron over many years worthwhile. Wayne, says: Sometimes this EA of yours is just brilliant, I really do LOVE it, take a look at the two trades below from last night. How perfect are those exits? Answer: Perfect! Glad you are loving it! Gustavo, says: Hello .. Good evening I'm using Robotron on multiple currency pairs and I'm doing very well. Do you have some other product that has good performance and works in some other way so that I can get it? Thank very much. Answer: You are very welcome Gustavo, glad Robotron is doing very well for you! Answer: Thank you so much for the kind words Tim, that really means so much to me and I am very happy to have met you also! Neil, says: Thanks for answering all questions so simply, promptly and directly. At the moment the trading is going like an express train (ie extremely well), I know it won't always go like that of course, but for the moment my wife and I are very happy - so far, so good.. I'm very happy with that for the moment. Thanks again. Answer: You are very welcome Neil, always happy to help where I can and answer your questions. Very pleased to hear that your trading is going very well. George, says: This EA has been the only one I have tested that can open and close an order in profit. When I say open and close please understand that I have tried in access of 50+ EA's and sure they can all open a trade, but how do they close the trade is where it counts and this EA can close trades. George, says: I have used this EA for the past few months in demo. I now switched to live on three different accounts and make 20% consistently every day. Yes, this sounds too good to be true but it is. 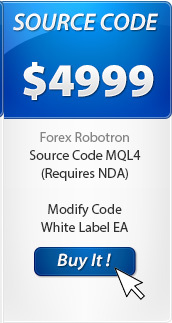 I for one will go WAY OUT OF MY WAY, to make sure Forex Robotron gets all the recognition it deserves because this EA is legit and works. Answer: Thank you so much George, those words make all of the hard work and dedication that has gone into Robotron worthwhile! Neil, says: Wow, I can see why people rave about your customer service - really I mean that. Answer: Thank you so much Neil, means a lot to me! Noom, says: I really love your robot! Answer: Glad to hear you love it! Ed, says: Dang dude. Your customer service skills are up there with the best of the best! Answer: Wow, thanks Ed, that is great praise indeed! Eric, says: Thank you for the updated version with the minutes. I made 3.24 percent today! Excellent robot! Answer: Great results again my friend! Teguh, says: I already use the ea for 1 month, and the result is great, when EA lose, it never touches my SL position, always close in the right time, loved it. Answer: Great to hear from you! Glad to hear your results with Robotron are going so well! Riccardo, says: Hello, the expert is very good ...thanks... yes it is profitable.....infact now i have 20.000? on my account after the start with 5000..... I have always 5% risk and 20 sl 100 tp and true on dynamic profit and loss. Answer: Very happy to hear that you like it Riccardo! Great results! Eric, says: Hello my friend, Okay, thank you! The robot works great! Keep up the great work! Thanks Forex Robotron Team! Answer: You are very welcome Eric, that is great to hear my friend! Always working to improve Robotron even further! Have a great weekend! Nick, says: Robotron has been running great! As you can see from the screen shot below I have been upping the lot size some to increase the profit. Diary, says: Robotron is very good and i'm happy with it, I have another EA running on one of my accounts but results not as good as Robotron. I will be dealing with you only, you are better dealing with costumer, quick answer and reliable robot mean you provide good service, wish you the best. Answer: You are very welcome as always and it is a pleasure to help you when needed. Very glad to hear Robotron is doing so well for you. If you need any more licenses just let me know. Have a great week! Zhang, says: I have run the ea about 10 days. Very impressive. The most brilliant ea i have every use. I can let it run and no worry about. Answer: Thank you so much for your kind words about Robotron, so pleased to hear that you are happy with it and getting such great results! Attila, says: Thank you very much for this ea, results are amazing. Answer: Great to hear my friend, so glad you like it! Zijian, says: I have gained 3.13% for the day! Clarence, says: Awesome, thank you so much! It's literally doubling the account every two weeks. That's crazy. Awesome ea you put together. Answer: You are very welcome, that is great to hear! Glad you are having good results and thank you for the positive comments! Arthur, says: Hello, Hi there.. robot is doing well. Answer: That is great to hear Arthur! George, says: Hello, Does your robot ever lose? It is still on a winning streak. If it's winning, I'm happy. Answer: Very glad you are happy with it! Jorge, says: Hello, Robotron is doing great thanks to your support. Answer: You are very welcome Jorge - I am so glad it is doing well for you! Wayne, says: Hello, I am really happy with Robotron, I think it is a great bit of kit and I'm sure I'd be hard pressed to find as good a Bot anywhere right now. Once again thank you for your ongoing generosity and support. Answer: Thanks again Wayne - very happy to hear those words! Made my day. Mahesh, says: Hello, How much would each additional license cost? I was considering taking one more. This EA is doing awesome. Answer: Glad to hear Robotron is doing great for you! Paul, says: Hi, Hope you are well. Ive got to say and I know its early days but your program appears to be outstanding. Ive never come across anything quite like it, I do get twitchy occasionally when a trade is running and I think shall I intervene and end the trade but ive managed to stay calm and the bot gets out of it on the upside. On top of a good bot your service has been second to none. I think as a nation we are all guilty to moan to quickly but not praise when we are pleased with things. So give yourself a big pat on the back from me . Kind Regards, Paul. Answer: Thank you so much for your kind words, it means the world to me and has been a pleasure talking with you. Most importantly, I am glad you are enjoying the performance! Thanks for the pat on the back, it's feedback such as yours that makes it all worthwhile! Kunj, says: My account is up about 10% since starting with Robotron. Answer: Good trading Kunj, long may that continue! Gavin, says: Good afternoon. You were kind enough to set up your product on a my account, once again I thank you for your help. BLOODY GREAT PRODUCT YOU HAVE BY THE WAY. Answer: You are very welcome Gavin, glad you are liking Robotron! 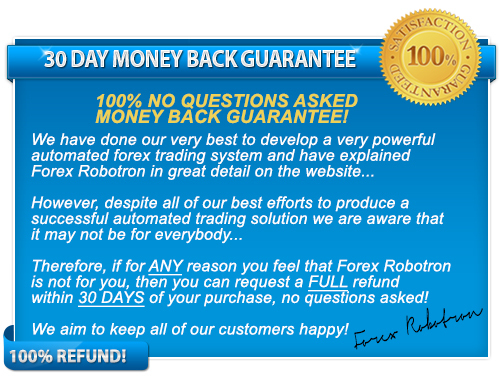 Nelson, says: I am using Forex Robotron for a few months, it is a very good EA. Answer: Happy to hear that Nelson! Benjamin, says: Loving the EA so far. Answer: Glad you like it! Dan, says: Hi!! 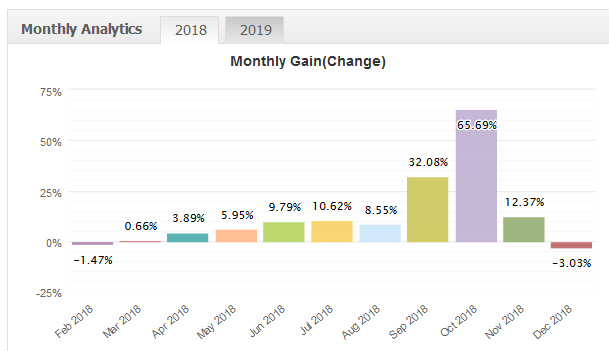 I hit 50% account growth this month!!!!! Answer: Hi Dan, Great returns as expected with Robotron! Have a nice weekend. Wayne, says: Absolutely amazing support, you guys are great, thank you. Answer: Thanks so much Wayne, that means a lot! Craig, says: Cheers.PS Robotron is going great first trade +12%. Answer: Great to hear! Your very welcome! Tony, says: The EA is still working fine with steady profits. Nelson, says: So Far, Forexrobotron is working very nice. Thanks for your wonderful EA. Answer: Thank you, you are very welcome and glad you like it! Kashta, says: Great Robot !!! Nelson, says: Forexrobotron is a great EA, I like it very much. No, says: Last month 44% my friend, now aiming to 200%. Forget about 100 percent, it is too easy :). looking forward to having 200 percent shortly. Thank you for your blessings also. It is Robotron blesses u! Thank you again for your wonderful EA. Answer: Congrats! Thanks for your kind words No. Gary, says: Really quite good for 8 calendar days of trading (12.59%). Thank you. Answer: Nice one Gary, happy to hear it! Brian, says: I have to say your support continues to be the best! Thanks so much! Answer: You are very welcome Brian, happy to help. Denny, says: Very good results! Good and fast profit with Robotron! Gary says: The 84.6% win rate is impressive (22 wins with 4 losses). Answer: Glad you like the win rate! Kashta says: I like Robotron. Keep me up to date with the next update. Great Robot !!! Answer: Glad you like it Kashta! John says: I have had Robotron for just over a month now and I am happy with the EA. Your EA wins on average 80% of trades! Answer: Glad you are happy with it John! Jim says: On 7/13/17, one week ago, I started with $500 on my brokerage account to do live trading on the EUR/USD - GBP/USD. As of this writing I am up $249.20. Answer: Hi Jim, Good results! Gavin says: Good afternoon my friend. I have been using your product since 5/7/2017 and it is trading exceptionally well! Answer: Hi Gavin, Glad your results are going well! Pennington says: $81 profit on 3 days of trading. Not bad! Alice says: You are the best customer service I have ever seen! Thanks a lot! Answer: Thank you for your kind words, that means the world to me - happy to help! If you need anything else just let me know. Stefan says: Hi, Another 14 pips this night. Hopefully my winning streak continues! Thanks! 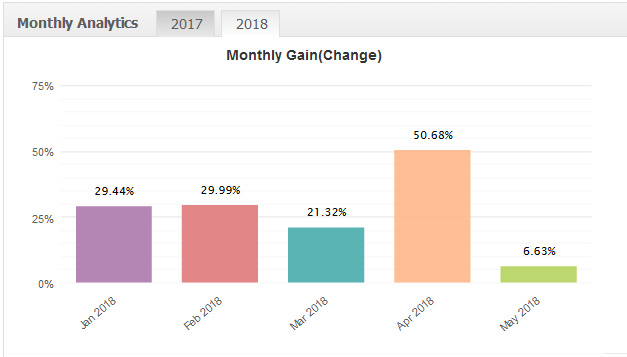 Teguh says: Hi FXrobotron, 7 months already with Robotron, and still happy with ea performance, since early April'17 almost get 300% in profit!! Answer: Hi Teguh, Very nice to hear from you and the great results you have had! Tony says: I have been using Forex Robotron since November 2016. It started showing a profit from day 1. The winning trades far exceed the losing one's which rarely go to stop loss. I feel it is by far the most consistent and profitable EA on the market today. 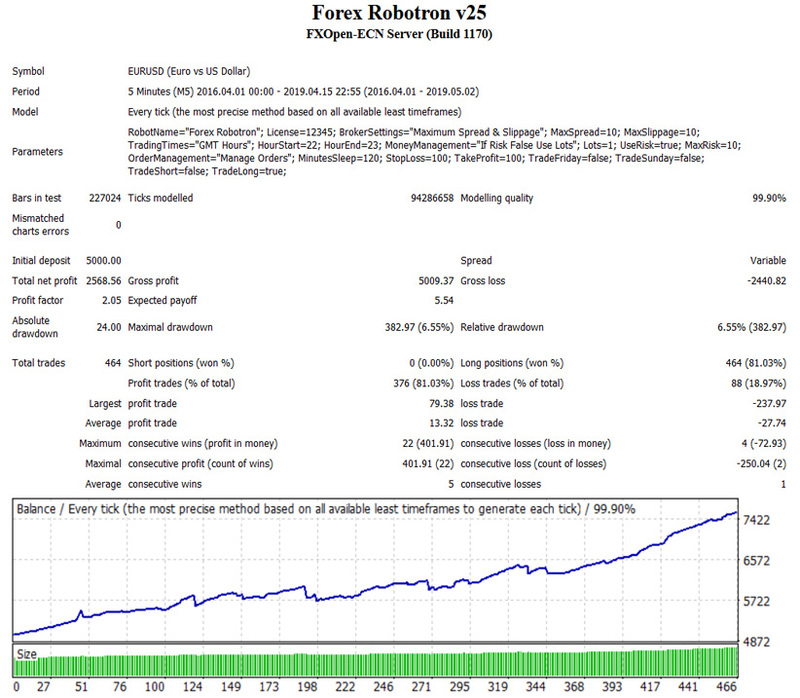 Stefan says: I use Robotron for half a year and the results are: 37,8% 29,8% This is on low risk 2. This month was really good and I'm very happy with Robotron . The win rate is amazing. Thanks! Denny says: I made 75 euros with Robotron yesterday, fast profit! Ahmad says: First of all I would like to thank you for your Robot and great support. I test your robot for few months now on live account and I can see the difference between your robot and others I was testing. Answer: Hi Ahmad, Thank you for your email and glad that all is well. Have a great weekend and if you need any more licenses just let me know. Paul says: I absolutely love robotron the way it is. Answer: Glad you like the EA! I will always keep you updated. Natalia says: How have you been? I have been using the EA and it works wonderful!! Answer: Hi Natalia, Good thank you and I hope you the same. Glad it is running well for you! Answer: Hi Dan, Great to hear from you as always and very happy that you are happy with Robotron! No says: Good profit today, 2-4 Percent up on each. Answer: Good results again No, happy to hear it! No says: Last night EA opened 9 orders, they were all correct, amazing and lucky for me. I got 3 percent something each. Sine Jan 2016, has begun from 100 USD now = 192 USD, nearly 100 percent profit already my friend. Answer: Good trading result again with Robotron! Dan says: 7.2% account growth yesterday... In one hour!!!!!! Answer: Hi Dan, Great results! Paul says: Hey, love the new update! Thanks! Answer: You are very welcome Paul! Bryce says: Hi, I bought the EU robot a couple of days ago and set it up an my account. It is working and I have had 4 trades which all made money. Bryce. Denny says: New version good profit! Dan says: Hi just checking in to see how V1. 3 is going :) I am still loving robotron. I am only using the 0.01 microlots at the moment but still up 29% on my account. Answer: Hi Dan, Good results! Franz says: Hi, I am happy with your Robot. I made 3 % this week. I hope it stay like this, thank you for your good work. I Love your Robot! Natália says: I hope you are doing well. I have been testing Robotron and I still like it very much. I want to let you know that I think Robotron is a great EA ... really it is! I even got my husband into testing it and he loves it too. Answer: Thank you for your email and nice feedback regarding Robotron, really that means the world to me :-) I am glad your husband enjoys it also. Christie says: A friend of mine also from South Africa, Evert introduced me to your robot. He also purchased the robot. I lost touch with Evert and saw him in April this year again. He told me that he still uses the robot and that he gets an average growth of 60% per month on his capital. Answer: Thank you for your email, I hope that you are well. Great to hear about Evert's consistent results - I regularly get thank you emails from clients with similar feedback. Tim says: I started using your EA this week and the results are very good. I am just trading on the EUR/USD and GBP/USD pairs. Answer: Glad your results have been good! Long may that continue. David says: You guys are the best. If you would like my 2 cents, you should tout your customer support a lot more. Other systems claim to have it, but half they time no one responds and if and when they do, they do not bother to answer the questions you ask. You guys are really great. I can't ask for anything nicer than that. Answer: You are very welcome David and thanks so much! Means a lot to hear that positive feedback. Hopefully we will talk again soon. Tim says: I have installed your EA and so far it is great! Answer: Great start, long may it continue. Gary says: Thanks. So far, Robotron is one of the best EA's. Answer: Great to hear Gary! Glad you like it. Brendan says: Just writing to let you know I'm enjoying Robotron and the work it does! Good stuff! I'm currently using it on GBP/USD and EUR/USD with 5% risk. Answer: That is great to hear, very glad you are enjoying it! Michael says: Hi Robotron support, your robot is amazing, I am profiting already, I would like to request more license when I am ready. Thank you! Answer: Thank you Michael! Glad you like it and sure, you can have as many licenses as you need (with the PREMIUM version), just let me know. James says: BTW...after the open trades I had going into the weekend closed last night I ended up + 8% for the week! Awesome! GO ROBOTRON! No says: Just to share with you. Yesterday made 5 percent. Today makes 2.6 percent. It starts coming back to make profit already. Answer: Great results No, long may they continue. Dan says: I really like Robotron. I think the EA is brilliant, your customer service is brilliant and I would like to know in the future of further EAs you develop. Answer: Thanks Dan, that means a lot. 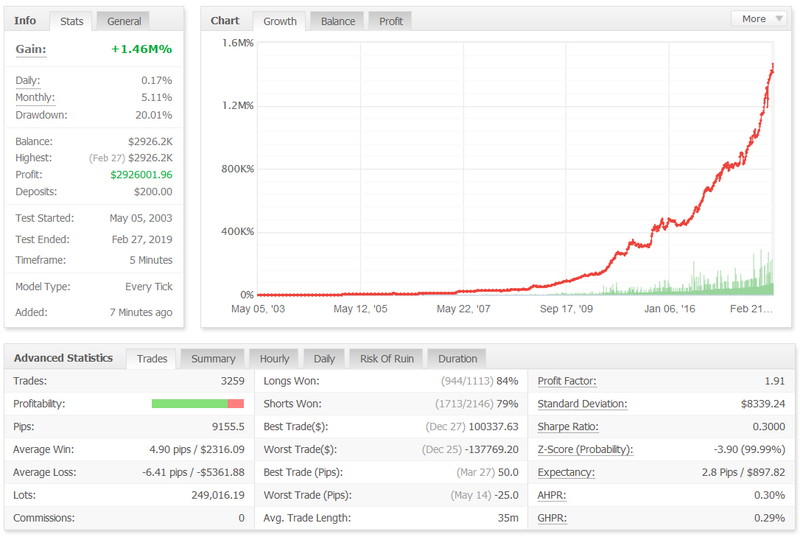 Ahmet says: Hello, I am using FOREXROBOTRON for 4 days and I must say I love it. Answer: Very happy to hear that you love it Ahmet! Adam says: Once more - thanks for being transparent and sharing your account details with me. You prove to continue to be a class act. Actually I must confess that I didn't check the most recent results before emailing you otherwise I would of seen the two massive wins on 13th Jan - that I see your accounts benefited from too! I think I'm going to look at a Robotron as a very long term investment. Answer: Nice to hear from you Adam, you are very welcome as always. Haruo says: I used Forex Robotron for about a month. And the result is very satisfied. Answer: Very happy to hear about your excellent results trading with Robotron! I hear this very often from Robotron users! No says: One account of my wife has been opened since 9 Jan until now, got 49 percent already. Answer: Wow, very happy to hear about your wife's great results with Robotron, in just one week! Dan says: Hi there.. Everything worked well tonight thank you with trades on all charts. 15 trades taken and 14 won, with a maximum loss of £0.01p !! wins may have only come to £3.02 after all costs...but that's more than 3% increase on the account in 1 evening!!!! Answer: Great trading Dan! Long may it continue! Arasu says: Hi there.. Yes.. I start to gain confident on this EA very much. So far its perform very good at my broker FBS (FBS- max 5% risk). Im really satisfy with this EA and THANK YOU very much for this EA. I hope this EA can continuously making profit in future. Thanks you very much for your great support - 5 stars! Answer: Very happy to hear about your results and that you are confident with the EA! John says: I am very pleased so far with the Robotron EA, so much that I have opened another new live account. Answer: So happy and pleased to hear that you are happy with the EA. Manuel says: Thank You, the robot is working great! Answer: You are welcome Manuel, glad it is working great for you! Terry says: Thank You so Much for All your Supports and I Appreciate that. This coming New Year 2017 will be the Year of Prosperity and Wealthy. I will take good care your Fx Robotron and will not harm or mis-used it. Surely, I will recommend it. Yes I will let it grow in very long times and please do let me know if Forex Robotron require update in future. Wishing a Merry Christmas and Happy New Year to You. Answer: You are very welcome Terry, wishing you a very Happy New Year! I will inform you of any future updates. Christie says: I had a wonderful trade last night at 30 cents per pip. I made over 80USD profit. Earlier this week I played 1 cents per pip, where profits were much smaller, bit still profit every day. On the long run the accumulation factor will do wonders. This is a truly wonderful program, and the fact that you provide it, and give the knowledge and access to Joe Public, is just amazing. With this you enable day to day working class people all over the world to build a substantial portfolio over time, Something the traders kept for themselves for decades. I sit in South Africa and your Robot enabled me to participate in the world market without knowledge or experience. Thank you so much. Answer: Thank you for your kind words, it truly means a lot to me and hearing things like that are what makes all the hard work I spent for 5+ years developing it worthwhile. Adam says: I just wanted to wish you a merry Christmas and a happy new year. You'll be pleased to know my robotron performance for the last 3 weeks is 80% growth. Which is wild. Answer: Thank you for your email, that is great news! Andrea says: Robotron is great. Steve says: Forex Robotron did real good again yesterday! This week I had 14 trades and only one loser. Super! Thanks! Answer: Great to hear Steve! No says: I got 21% already from my initial deposit WITHIN ONLY 8 Days. UPDATE: The account is making an average of 4 percent each day. Answer: Glad to hear about the results! Tom says: Looking really good so far very excited to quite honest, bit of a new chapter for me, never tried out the auto trading. Thanks again and talk soon. May the pips be with us!! Answer: That's great to hear Tom! Really happy to hear it! Dan says: I installed your robot on my account yesterday afternoon and it started to open up trades. It opened up 5 trades and did very well! Evert says: It ran for the first market day and had a growth of just over 4% for the first day. Needless to say I am super impressed and I have to admit; a little relieved. Thank you for the support. Happy happy. Answer: Thank you for your email Evert, glad you are off to a good start. Adam says: Just thought I'd let you know that Robotron is up almost 50% and it's not even 2 weeks now. This could be an absolute life changer for me, and I honestly believe it can be. You've obviously put in a lot of work on a quality piece of software. I'm sure I'll be thanking you for months to come. Thanks for making the software available. It says a lot about your character that you would let other people benefit from your software, when you could just horde it away. Answer: Thank you for your kind words Adam, you are very welcome and it makes it all worth while when I hear positive feedback from users such as yourself - which I often do. Pravin says: So far so good! Started on demo now trading live. Answer: That's great to hear Pravin. Andrea says: Robotron is very good! No says: Once again, thank you for your fast and furious 8 support, awesome. Kel says: I am very happy with the results and can confirm this is a long term strategy for me. Have a lovely weekend. Answer: Glad you like the EA! Your very welcome Kel - that made me smile and glad to hear you are happy with it - I get a lot of emails saying this! Thanks, have a great weekend also. Alessandro says: Congratulations for your EA and thank you for your support! Answer: Glad you like the EA! Your very welcome. 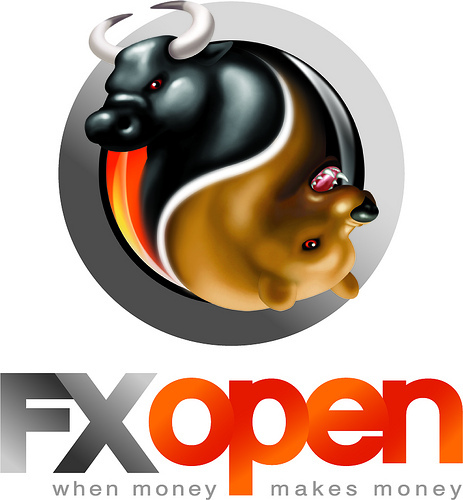 Brad says: I've been using this on an account I have with fxopen (Australia) and it's working well. Answer: You are very welcome. Eric says: Thanks. I'm doing super well. Yes indeed, the EA seems to have timeless qualities. I found it seems to work well on other pairs also. Answer: Your welcome as always Eric, great to hear! Answer: You are very welcome Vaclav! 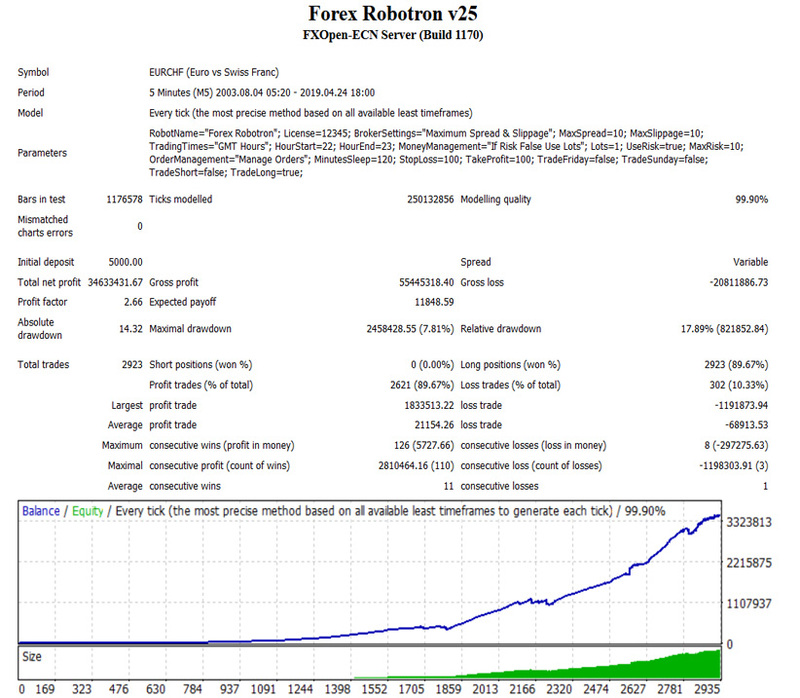 Enrico says: Forex Robotron runs very good on my accounts! Thank you! Dennis says: Thanks for the recommendation on this robot. In three days, it's already paid for itself several times over. It helps to monitor the trades, that's where I'm seeing big opportunities. Rhett says: Well, I tried six different commercial programs and Robotron was the only one to have successfully made money and also successfully limit risk. Answer: Your very welcome Rhett! Brian says: So, We had an UNBELIEVABLE day yesterday. Probably the best I've seen Robotron do. Answer: Thank you for the feedback! Teguh says: Good day! Your robot is great both demo and real! Nice profit ratio. Recent 3 days i get 14%. Brian says: Perfect thanks! Both my Demo and Live accounts had an awesome week! Answer: Your welcome Brian, glad it is going well! Robin says: Just wanted to give you heads up the robot did excellent again today... Very happy with it so far. Answer: Thanks for the feedback Robin! Answer: Your very welcome Eric, glad you liked it. Answer: You are welcome, glad you like it! Kel says: Your support is incredible, thank you. Answer: Anytime Kel, happy to help. Answer: You are very welcome Robin. Rhett says: Thanks for your great support! Answer: You are welcome as always. Paul says: Congratulations to this really good EA. The EA still running pretty good. Thank you very much! Answer: You are very welcome Paul. Arthur says: Thanks So Much!!! Awesome service and a Awesome Robot! I will recommend it to my friend. Answer: Thanks Arthur, you are very welcome. Mick says: Hi, the EA has averaged around 3 or 4 per cent per day which is just terrific. I am really happy with the robot. Answer: Glad it is going well for you! Lyndall says: Hi there, just wanted to give an update. The EA has performed rather well, in the last 3 weeks it's opened a good amount of trades and inly lost on 2 trades total. I'm making between 2 and 3 percent daily account increase. Thanks for helping me get this to work as intended. Answer: GREAT! It was a pleasure to help. Nick says: So far I have tried so many different EA's with promises of grandeur only to fail on the first real test on a live account. Luckily and thankfully yours is not one of them. My account is tiny at the moment but showing (be it in smaller amounts signs of growth). Answer: Glad you are enjoying the EA! Patric says: Thank you for the AMAZING product. I wish I knew how to program something as amazing as this robot, because frankly IT is insane. Answer: Hello Patric, Your very welcome, thank you for your kind words. Erik says: I like your bot. I love your creation's performance. It's a piece of art. I would like to request one more license. Could I have a license for one more account please? John says: Thank you for sharing this excellent forex robot! It is by far the best I have used so far and I have used many! Answer: Your welcome John, glad you like it. 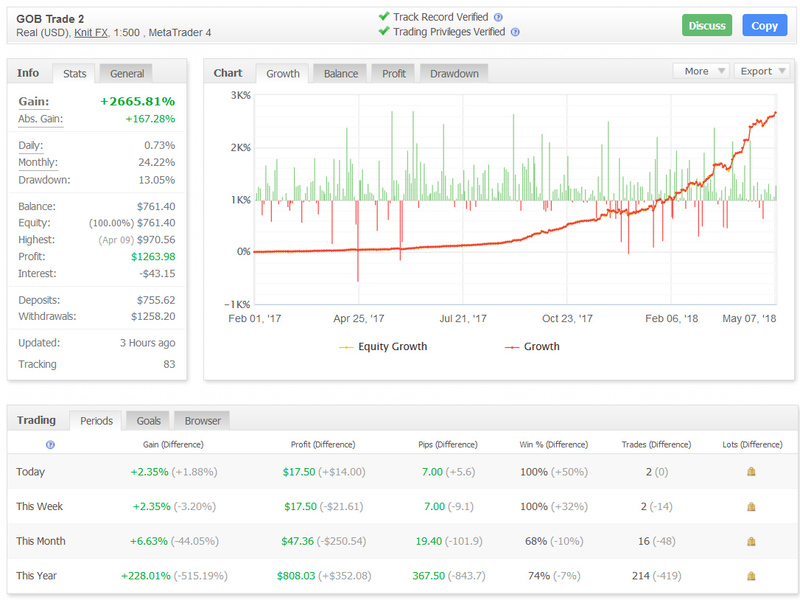 Owen says: Everyday forex robotron is making winning trades and my account is growing fast, great work on this automated forex system! Answer: That's great news Owen, glad we could help! 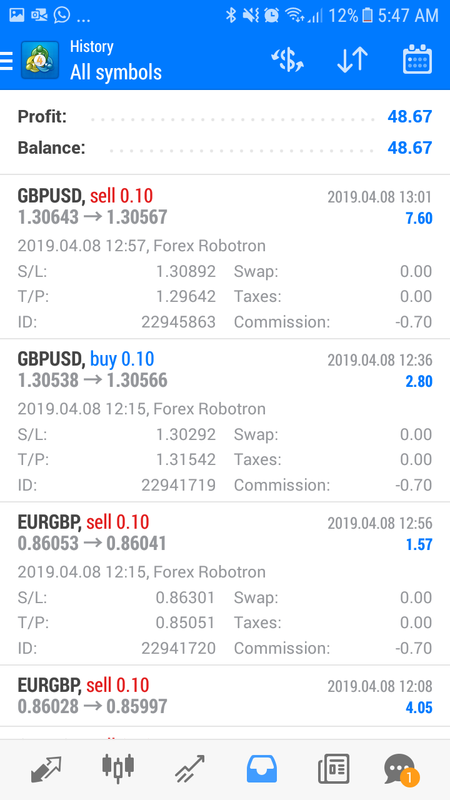 Eileen says: I was skeptical at first as I have been burnt by forex robots before but my doubts were soon gone within a week of profitable trading, thank you so much! Anthony says: I love the consistent trading with sensible entries from forex robotron and plan to use it for many years to come, also thank you for helping me get setup with your excellent support. Answer: Your more than welcome Anthony, that's what we wanted to achieve with Forex Robotron. Thank you for the feedback! 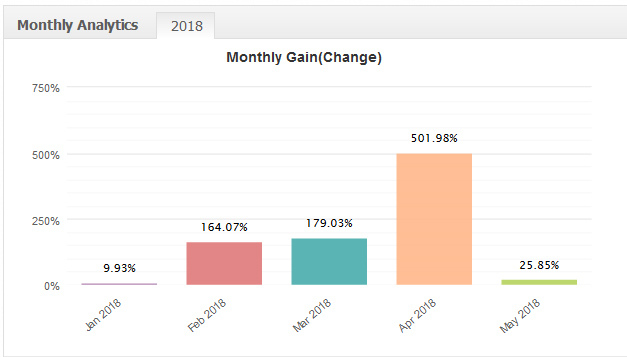 Mary says: I setup forex robotron a few weeks back and have just checked my account and I am amazed at how fast it has grown - I was not expecting that! Thank you for this great opportunity, you have really done some great work with this automated forex system! Answer: Congratulations on your results Mary..
Henry says: Just a quick email to say thank you so much for this great automated forex trading system and your support. 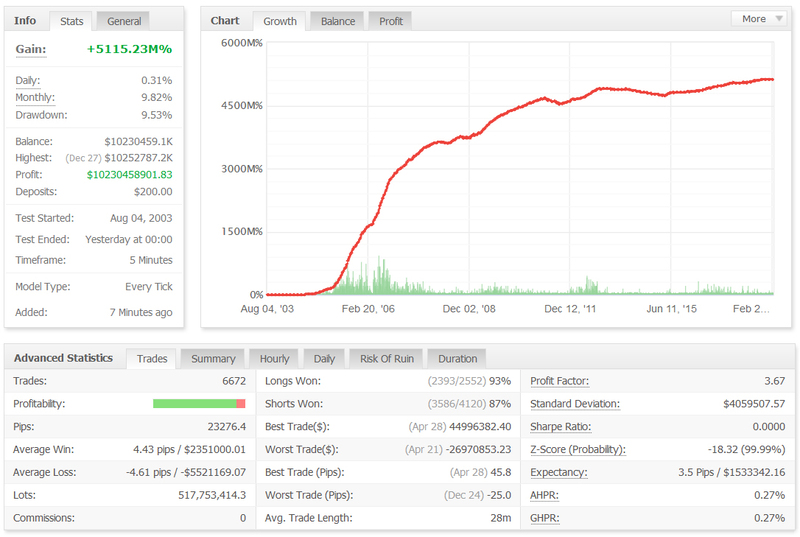 The results have been superb so far, better than any other trading system that I have tried before. Keep up the good work! Answer: Your very welcome Henry, glad you like it. If you need anything else just get in touch! Kenneth says: I had my first week running forex robotron and just wanted to let you know my account is up around 15% already. If this continues I will be very rich in no time! I especially like how the system trades very frequently with high accuracy. James says: This thing is like an ATM! Winning trade after winning trade! Surprised you made it commercially available and didnt just retire to an island somewhere! Forever grateful that you give the average trader like myself such an fantastic opportunity especially after all the other forex robots I have previously tried let me down. Forex robotron blows them all away. Cheers guys! Answer: It's a pleasure James. 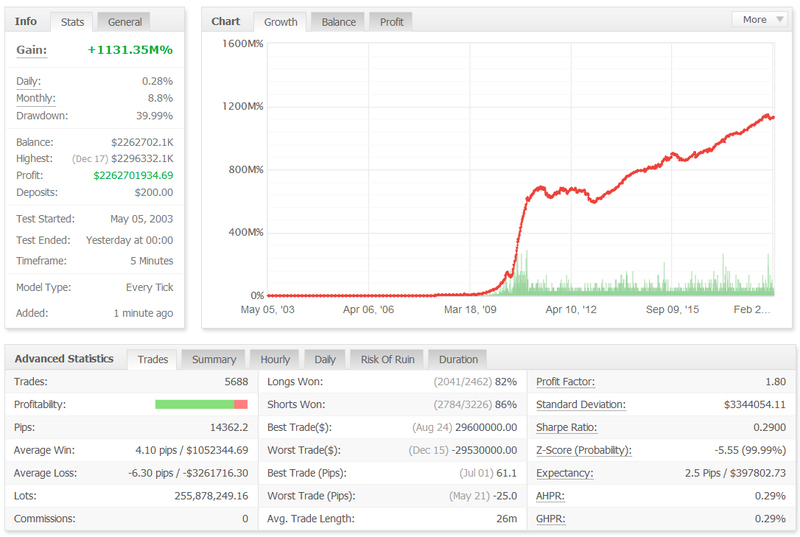 Good to hear you are enjoying the success of Forex Robotron. 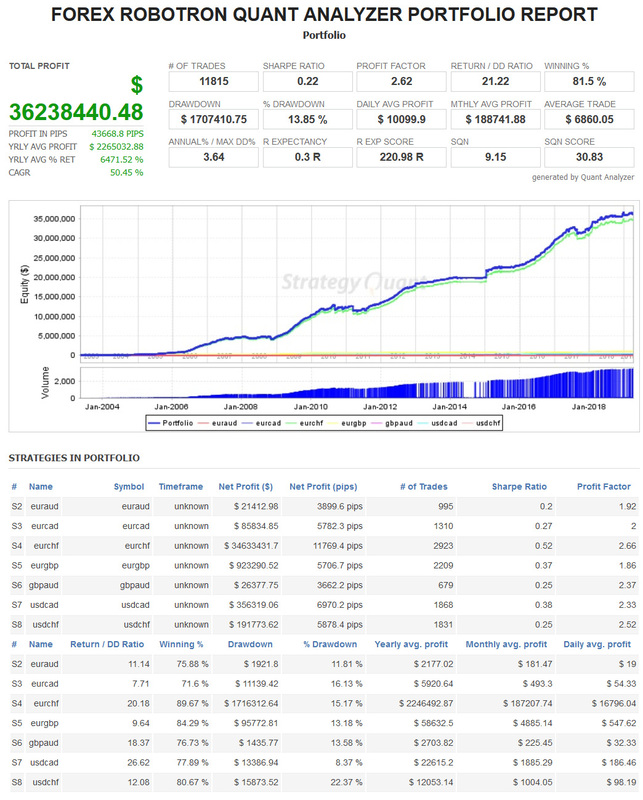 Eric says: By far the best forex robot I have ever used, thank you so much. Answer: Your very welcome Eric, glad you like it. Rami says: I like how this forex robot makes me money everyday without using lots of risk on my account and provides plenty of trades. I will keep using it and hopefully will be able to leave my day job soon. Answer: Congrats on your results Rami! All information on the Forex Robotron website is for educational purposes only and is not intended to provide financial advise. Any statements about profits or income, expressed or implied, does not represent a guarantee. Your actual trading may result in losses as no trading system is guaranteed. You accept full responsibilities for your actions, trades, profit or loss, and agree to hold Forex Robotron and any authorized distributors of this information harmless in any and all ways.